Here is some required reading for those of us that like to get under the hood so to speak. There are many key aspects to managing Exchange 2007 that can only be done from the new shell. In fact, any commands that we can do in the Exchange Management Console (GUI), actually get executed in the Exchange Management Shell. Microsoft Download: Introduction to the Exchange Management Shell. Microsoft Download: Exchange Management Shell Quick Reference. TechNet: Using the Exchange Management Shell. The command line can be a bit intimidating at first. But, we have some pretty good resources in the above links. The in-shell help is definitely refreshing. It looks as though Microsoft has learned, at least in the case of PowerShell, from the *nix community and the very well put together Man Pages (Wikipedia). Besides in-shell help list at the top of the new shell window, there will be a Tip of the Day. That is a pretty neat little feature to provide us with a, "Oh, I didn't know that" moment. :) Definitely take a moment to read through the tip as it may provide the answer to a question down the road. We had a pretty bad stomach flu run through our family. Jean-Luc still hasn't had it yet and hopefully will not. Monique, Anne-Marie, and Raymond have all had it. It struck me down a couple of days ago and I am just now coming back up for air! Blog posts may be infrequent for a bit during recovery mode. You can obtain the SBS 2008 trial download from here: Windows Small Business Server 2008 Trial. Note that there are four (4) DVDs to download. The SBS 2008 Recovery Technologies DVD is missing. Whether that is also the case for the trial DVD kit will be seen next month sometime. We will be placing an order for the DVD kit to be shipped to us when they are released. As a result, currently the only places to obtain the Recovery DVD are via TechNet, MSDN, or the Microsoft Action Pack Subscription which we just received. One of the primary tasks for us once we are familiar with the setup of a product is tearing it down and putting the pieces back together again. That is the only way to get to know a product and how it will behave in the midst of a true disaster. That in turn keeps the pressure and stress down to a somewhat manageable level while working on a recovery. We even go so far as to destroy the RAID arrays on a new server and restore the just completed backup. If it works, we are good to go. If it doesn't, we need to know why pronto! Vista Error - You can't save here. Please choose another location. While working on some screenshots, there was a need to figure out what folder the current screenshot needed to be saved in. In Windows Vista, the top right corner of the Save As dialogue box has the search function built in. Once a keyword was punched into the search to verify that the right folder was selected, there were a lot of screenshots in the folder, the Save button was clicked on. That was a pretty puzzling one at first. After clicking the "X" to the right of the search term to eliminate the search results and clicking the Save button again and it worked. A bit of a strange hang up, but it looks as though the search results eliminate any reference to the current folder the search was initiated in. This hiccup happens in both the Save and Save As dialogue boxes on Windows Vista for any application that offers the search box in the top left corner and a search was initiated with the results showing. x86 PushPrinterConnections.exe a must for the Technician's Thumb Drive! We need to make sure that we have a copy of the 32bit version of the PushPrinterConnections.exe utility on our Technician's Thumb Drive, but also our Technician's site on our CompanyWeb. Make sure that the ZIP file with the utility is appropriately labeled x86 or 32bit so there is no confusion. Keeping the x64 or 64bit version of the utility on the Technician's Thumb Drive would also be a good idea for those just in case moments. We managed to obtain a 32bit copy of the utility from one of our Windows Server 2008 x86 DVDs by mounting the WIM image in read-only mode and copying it off. Having a copy of the utility is important because the only way we can deploy printers to our client workstations now is via Group Policy. It, among a few other items were a sign of Satish Kanwar and Matthew Wolodarsky's appreciation for helping out with the Windows Vista Webinar a week or two ago. It was unexpected, thus the pleasant surprise. Since receiving the cap, it has been on my head pretty much the entire time I am out and about on client or other business. People's reactions to the cap are amazing! Windows Vista: "You either love it or hate it" seems to be the general theme. One of the young fellows working at the local Tims I frequent commented on, "cool hat". Today, after filling up the car and paying for the gas, the fellow who paid for his gas just before I did struck up a conversation on the fact that he just purchased his first Windows Vista computer and was feeling a little overwhelmed. I mentioned Vista Small Business Assurance Program to him to get some free support for his initial questions. He was pretty impressed by that. 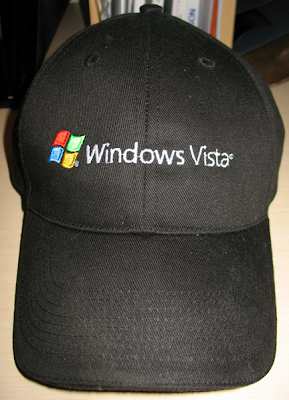 For some, it was a double take at the fact that they did indeed see Windows Vista on the cap. General concensus here: We enjoy Windows Vista. We appreciate the features that allow us to work more efficiently. We appreciate the strengthened security and hope that security is maintained in Windows 7. Okay, so, we have our Group Policy setup for deploying printers: SBS 2008 - Deploying Printers. Description:Could not execute the following script PushPrinterConnections.exe. .
Head out to do a search and we turn up this TechNet article: Scripts deployed to computer do not run (Userinit events 1000 and 1001). Nothing pertaining to our problem there. A further search based on the PushPrinterConnections.exe error brought us to the EggHeadCafe which gave us to the clue about the x86 versus x64 version of the utility. Well, that is all fine and dandy, but we are running 100% Windows Server 2008 x64 versions! So, where do we get an x86 version of the utility? We download the WAIK for Vista SP1 and Server 2008 and install it. Then we download an x86 version of Windows Server 2008 via TechNet or the MVLS site, mount the WIM image from that disk and copy the utility out! Ouch! But, once the 32bit copy of the utility was in place, we are good to go! Our printers deployed. But, this situation does present a bit of a pickle for anyone that runs through the deployment as per the Help file and ends up in the position where they have no where to turn to get the utility. Download the WAIK and a trial version of Server 2008 x86? Probably not. Microsoft: We do believe that packaging this utility's 32bit and 64bit versions up on the Microsoft Download site might be a good idea. We now have our software keys for all of our sites covered by our SBS 2008 Premium Open Value Agreement. ISA 2006 + Windows Server 2003 Std. More than likely, we will be calling into Microsoft Licensing to obtain a Microsoft Applications key for SharePoint Designer and Outlook, a Microsoft Windows Server 2003 R2 Standard key, and to have the download links made active in our MVLS portal. We have an e-mail out to our trusty licensing expert Bill C. at Synnex Canada and hopefully he will be able to help clarify for us. The bonus in purchasing SBS 2003 R2 Premium besides the above? Two extra server licenses. We get the SBS 2008 Premium second server, and the Server 2003 R2 Standard to run ISA 2006. That is worth a good chunk on Open Value per server, or to purchase outright. And the adventure still continues as the replacement for ISA 2006 will be the next and final step in our Software Assurance benefits for SBS 2003 R2 Premium! As was mentioned: SBS 2008 Premium Open License part number missing on Nov Price List and our supplier had a hard time getting the order fulfilled. Well, supposedly our media arrived on Monday and we received it!?! But, it is not here. After staring at the name on the courier's tracking report, it took a few minutes to realize that the first initial last name may belong to a person working at one of our clients. A phone call down there and sure enough, somehow the order ended up at their location instead of ours. A phone call back to the supplier to let them know about the mix up and they indicated that the order was manually fulfilled down South. The person doing the work probably remembered our business name but saw it on all of our client's licensing agreements as Reseller and took a risk on one. So, off to get the kit. Patriotism is alive and well in Canada: Highway of Heroes. Our message to all of you who serve or have served in your nation's military: Thank You! We stand with you 110% and we support you 110%! In our family my Grandfather served, and my Father served. Thanks Gramps! Thanks Dad! Now that we have experience with "going native" on the SBS/Server 2008 platform, one of the most pleasant surprises is the improved network data transfer speeds. We have seen the posts around that indicated "problems" with Vista file transfers across networks since RTM. We have finished a number of client upgrades and server refreshes to all Vista/SBS 2008/Server 2008 and the change in transfer speeds is mind boggling. We are now consistently getting 50-80MB/sec across the wire with the bottleneck being the system setup that is transferring data TO the Server 2008 box hosting the data. The higher the horsepower the workstation running Vista, the closer to 80-100MB/sec we are seeing. Yes, Megabytes per second. Disk subsystem becomes the bottleneck on the workstation. That is where a good RAID 1+0 setup makes a huge difference in system performance and network transfers. A RAID 1+0 setup is something to keep in mind for your clients that require large file transfers across the network to run their daily business. With the advent of inexpensive storage, having four 320GB or 500GB Seagate Barracuda drives configured in RAID 1+0 is relatively inexpensive compared against the 40-60% performance increase the RAID setup yields. Many of the current desktop motherboards can even support a hot spare! Need to step that performance up another notch? Then the Western Digital VelociRaptors would be the drives of choice and an add-in Intel RAID Controller such as the SRCSASRB PCI-E 4x or SRCSASJV PCI-E 8x controllers will really make things fly! The end of last month was very busy for us. On Wednesday October 29 I had a small part in the Winning with Windows Vista Webinar facilitated by Satish Kanwar and Matt Wolodarsky who is a product manager with Microsoft Canada. Matt speaks about a new program for small businesses is being introduced here in Canada called the Vista Small Business Assurance Program. The program will provide one-on-one free high level support for new Vista users. I spent a little time focused on how we Microsoft Partners can augment our Windows Vista skills and develop a passion for the product by knowing its feature set. One way to do that is to get Windows Vista Software Assurance and tack on the Microsoft Desktop Optimization Pack for our small I.T. company. Check out the Webinar for more info. You can download the Webinar after logging onto the Microsoft Event's Web site. The second Webinar that I participated was on Thursday October 30: SBS 2008 Setup Webinar. With Harry Brelsford, my co-author for our upcoming SBS 2008 Blueprint book, we ran through an SBS 2008 setup from start to nearly finished. The setup was without an Answer File so everyone could see what the setup routine would look like. Thank you for the great questions, and especially to those who challenged me on some mistakes that I had made in what I did or said! All in all, the SBS 2008 Setup Webinar was a blast ... even with the stalled VM at the beginning. Check it out. We had a blast, and judging by all of the feedback we received once the Webinar completed, so did a lot of you that listened live. Hopefully we will have a few more Webinars in the coming months. I am certainly looking forward to it! Intel held a challenge for Intel Partners: Desktop Innovation Showdown. We received notice near the beginning of the month that both of our submissions had reached the semi-final round. Neat. Our submissions were in the Extreme Gaming Desktop category and the Business Desktop based on Intel vPro Technology category. We just received an e-mail indicating that one of our submissions has won. Though, at the moment we are not too sure which category yet as the details have not been released yet. The suspicion here is we won in the Business Desktop category! For our entries entering the semi-final round we won an Intel DG45ID Desktop Board and an Intel Q9550 Core 2 Quad processor. For actually winning one of the categories, we won a 32GB iPOD Touch. Neat! We will also get honourable mention in RAM Magazine and Tech Insight magazine! Have a boo at the videos and let us know what you think! They were put together on our iMac in the shop and there was a bit of a struggle trying to get any transitions to happen ... but they still turned out alright. We had fun putting them together and they will give you a good view of our existing Extreme System we have had for a while now and our standard Corporate Platform based on Intel vPro Technologies. Intel's vPro is a designation for the "Q" series Desktop Boards that support Active Management Technology. This is an Out of Band management capability that only the "Q" series boards have. We love it. It makes our lives a lot easier when it comes to remotely managing our client's systems and now laptops too! We mentioned that we Ordered the SBS Premium Media kit for our SA Fulfilment. That order was placed a few days ago. Normally media orders are pretty quick. So, when we noticed that the order was stalled in our supplier's queue still unfulfilled we dropped them a quick e-mail to find out why. The SBS Premium media part number: T75-00169. If you go to order the part number, do not accept an answer along the lines of, "It does not exist" or "We do not have that part number in our system" or anything else along those lines. Apparently a mistake was made on the price lists for November as that part number is not there. So, make sure to talk to your licensing supplier and have them inquire directly with Microsoft if you have received the above misinformation. We are fortunate that our licensing contact at Synnex Canada, Bill C., really knows his stuff! Just another reason that a TechNet Plus subscription is pretty kewl ... access to RTM bits before access to RTM bits is in the public sphere! Take note that the core servers for EBS are 64bit only just as it is for SBS 2008. Intel is putting on a Webinar on the new i7 series processors here: Intel i7 Webinar. Okay, so maybe the Internet connection here is behaving flaky which it very well may be since the connection keeps dropping. Log into another one of our sites via RWW and try again, and we get the same result. When the connection was eventually made, the audio portion of the presentation kept dropping. The service was facilitated by Adobe's online services. All in all, the whole experience was quite frustrating. This is very surprising considering that the presenter is Intel and they are utilizing Adobe for their online services. Courtesy of Susan who linked to Kevin Remde and the code. We are on a TechNet Plus DVD subscription. Why not go to the TechNet Direct and forgo media and shipping costs? We like to have an archive. With that archive we can gain access to products that may not be available via download anymore. Access to the latest and greatest Microsoft products to evaluate with no time bomb. Great for setting up a mirror of our client's networks and testing things and breaking things ... on a nonproduction environment. Install as many copies of Microsoft products into a lab setting as needed. There are no limits. Access to RTM bits way before anyone else ... okay, except maybe MSDN subscribers. Beta and CTP product access. Work on those future projects now. Learn new products coming down the pipe. eLearning ... more ways to gain brain knowledge and apply it ... in the lab! Newsgroup support to ask those tough questions that don't seem to have an answer anywhere else. All of our labs are built on products obtained through our TechNet Plus subscription. The MAPS just does not cut it for building out a proper lab setup. So, for new subscribers only, you can get a 15% discount if you enter the following promo code until June 2009: TMSAM08 (that is zero-eight). TechNet Plus is another step for the small I.T. shop to build itself up as a truly professional endeavour. Since we would like to see the media kit before our quarterly update, we went ahead and ordered the media through our supplier. We will see what the media pack looks like when it gets here. If it is SBS 2003 R2 Premium, it is no big deal since we have a number of sites licensed under our Open Value Agreement and only one media pack so far. We will be sure to keep you informed when we do receive it! Whenever we setup a new client, whether they run with a Reputation Services Provider or not, we always have the client's ISP or DNS hosting company setup an SPF record for their e-mail domain or domains. What is an SPF Record you may ask? It stands for Sender Policy Framework. It allows e-mail to be transmitted with a different return e-mail address stamp than the network it is being transmitted from. For example, our @mpecsinc.ca domain has an SPF in place to allow our domain @mpecsinc.ca e-mail to be transmitted from either Nucleus or Interbaun's networks since our e-mail servers reside on both ISP's networks. Without an SPF in place, some spam filters out there will drop e-mail with a return e-mail address that is not associated with the network it is transmitted from. In many cases, the e-mail servers or reputation services providers will not provide an NDR either. This means that the e-mail will essentially disappear. Note that our Internet DNS already has the SPF records in place. Continue on in the wizard and we will be asked questions to make changes to the above SPF settings. The final step is the SPF generation itself which will coincide with our current setup. Once you have those settings in hand, an e-mail to the Internet DNS host will get that record in place. The link: Microsoft SPF Tool. This is one more little way we need to be aware of the way e-mail is handled. Being aware of the need for an SPF record is one less thing to look for when troubleshooting e-mail transmission problems. Need a quick way to test your client's DNS setup? Check this tool out: Men&Mice DoDig. You need to know the ISP's DNS server, the domain name you are researching, and select the ANY option to get the full DNS setup report. This tool is very handy when in a pinch and trying to diagnose Internet facing DNS issues. Eric has mentioned that SBS 2008 will maintain the traditional delivery method for Software Assurance: No, SBS 2008 media is not going to be downloadable through Volume Licensing in November. Keep in mind that media is not the problem. Open Value licensing with Software Assurance for SBS 2003 R2 Premium gives us a TechNet Direct subscription which provides downloadable ISO media. It is the license keys that present the gotcha. For now, after a number of calls into the various Microsoft Licensing phone numbers, Shayla in the Volume Licensing Department gave us a refreshingly succinct answer: "Call your reseller for your media fulfilment". Open Value Licensing with Software Assurance does provide quarterly shipments for updated products. In our case, we do not want to wait for our quarterly shipment to receive the media. An e-mail has been sent off to our favourite Microsoft Licensing supplier (Synnex Canada), and we shall see what their response is. A while back, we purchased some Logitech MX Revolution and posted a review: Hardware Review: Logitech MX Revolution. Essentially, it is an awesome mouse. Recently, we had need to pick up some mice for a few of our shop laptops, and since the MX Revolution was not necessarily the best option for a laptop, we looked at a few other models. We settled on the Logitech VX Revolution. The mouse is excellent. One of them ended up connected to the laptop being used at home to write the upcoming SBS 2008 Blueprint book. The surface it is being used on is our dining room table which is a flat white melamine. The mouse tracks flawlessly across the table and the very large glide pads make the effort to move the mouse about virtually feather light. The scroll wheel has the ability to move freely or have a click-lock style of movement. On the MX Revolution, that action changes automatically depending on the application being used. On the VX Revolution there is a slider switch on the bottom of the mouse to switch between modes. Logitech has branched out as far as their product lines are concerned. However, their ability to design and manufacture a computer mouse is definitely at the top of the list as far as quality and features are concerned. One neat feature of the mouse for those of us prone to losing small items that are necessary to the operation of a device like say the radio receiver: This mouse has a small slot in the back that the radio receiver tucks into that also turns the mouse off thus saving battery life.